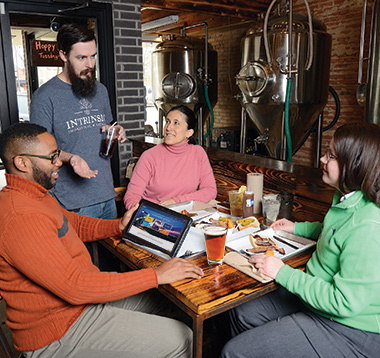 Cary Hodson recently opened Intrinsic Smokehouse and Brewery in Garland’s historic square. It was his dream, he said, to help breathe life back into his hometown. With DART’s Downtown Garland Station increasing traffic in the area, he couldn’t think of a better location for his new business. Hodson took a unique approach to generating the capital for his small business. Using crowdfunding, he raised $30,000. The rest came from personal savings and a small business loan. When asked why he chose Garland, Hodson replied, “Why not?” He had observed that Downtown Garland Station is well-used and he is confident that DART will continue to spur growth and positive change for the area. Downtown Garland is just one transit-oriented development success story. In communities like Irving and Richardson, vast fields are being cleared, making room for residential and commercial development. Downtown revitalization also is taking shape in Carrollton, Plano and Rowlett. This story appeared in the DART progress report for the 2015 fiscal year. Read more stories on DART.org.